“Free Plesk Special Offer” is only valid to new customers who firstly purchase Standard Cloud Servers (L108 or above) on or before April 30, 2019. Each applicant can enjoy this promotion once only. Applicants need to contact LayerStack Customer Service team to claim the free Plesk Onyx - Web Pro Edition service upon verification of identity. LayerStack shall waive the Plesk service fee equivalent to the Cloud Servers service plans pre-payment period up to 12 months in maximum. This promotion does not extend to server upgrades or service renewal. This promotion cannot be used with any other discounts, promotions or offers. The offer is subject to these terms and conditions. LayerStack reserves the right to amend and explain the promotion without any prior notice. In case of any dispute, decision of LayerStack Limited shall be final. “Switching Offer” is only applicable to subscription accompanied by a valid payment receipt or invoice of cloud server service in the last three months issued by other cloud service providers. 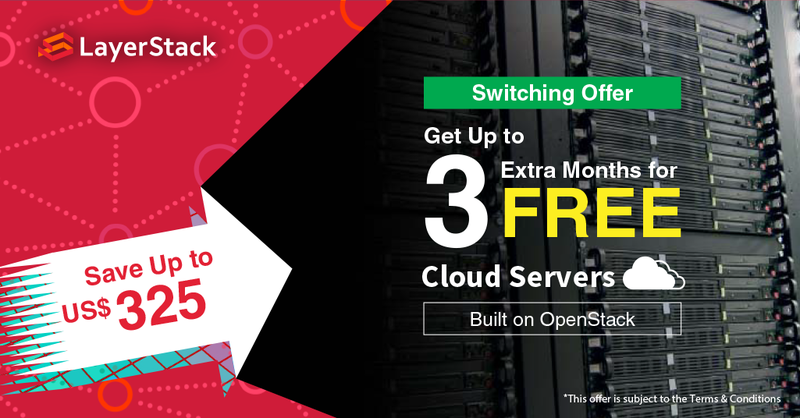 Switching from other cloud service providers can enjoy extra 3-month free service. Free Service is valid for clients who can submit existing service receipts by other hosting service providers. LayerStack shall waive the service fee equivalent to the remaining service period of existing hosting service up to 3 months in maximum. This promotion is valid to new customers who purchase Cloud Servers (L008 or above), High Memory Cloud Servers,High Storage Cloud Servers or CloudNet with 12-month full payment settled. This promotion does not apply on service renewal. This promotion shall not be applicable to any other promotions at the same time. The offer is subject to these terms and conditions. LayerStack reserves the right to amend and explain the promotion without any prior notice. In case of any dispute, decision of LayerStack Limited shall be final.